Online voting opened Tuesday for the eighth Secretariat Vox Populi Award. Created by Secretariat’s late owner Penny Chenery, the Vox Populi, or “Voice of the People,” award recognizes the racehorse whose popularity and racing excellence best resounded with the public and gained recognition for the sport during the past year. Fans can vote in the online poll, which can be found at Secretariat.com, for one of six nominees selected by the Vox Populi Committee this year. Voters may also have the option to write in a racehorse of their choice. The poll is open through Dec. 12, and a public presentation to the 2017 Vox Populi winner is scheduled for Jan. 20, 2018, at Santa Anita Park. Arrogate, the talented and enigmatic 4-year-old colt who in 2017 became the top all-time North American earner after impressive wins in the inaugural Pegasus World Cup Invitational Stakes and the Dubai World Cup. Ben’s Cat, the late, four-time Maryland Horse of the Year who amassed the devotion of a legion of fans in an eight-year racing career that concluded in 2017. 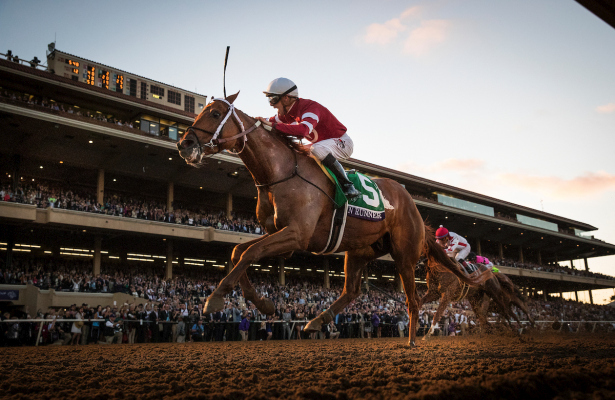 Gun Runner, the commanding 4-year-old colt whose outstanding achievements this year include $6.9 million in earnings and four consecutive Grade I victories culminating with the Breeders’ Cup Classic. Lady Eli, the sensational 5-year-old racemare who overcame laminitis to win three of her five 2017 starts finishing out a stellar career. Patch, the one-eyed, 3-year-old Triple Crown contender who ran third in the Belmont and garnered international fanfare for prevailing over obvious challenges to compete at the sport’s highest level. Songbird, the fabulously competitive 4-year-old multiple graded stakes filly who retired in August and recently sold for a whopping $9.5 million at the Fasig-Tipton November sale.